It is not every day that grade school students get the opportunity to speak with and ask questions of their representative in Congress. For a handful of scholars at Freedom Prep Charter School, Wednesday was their lucky day. U.S. 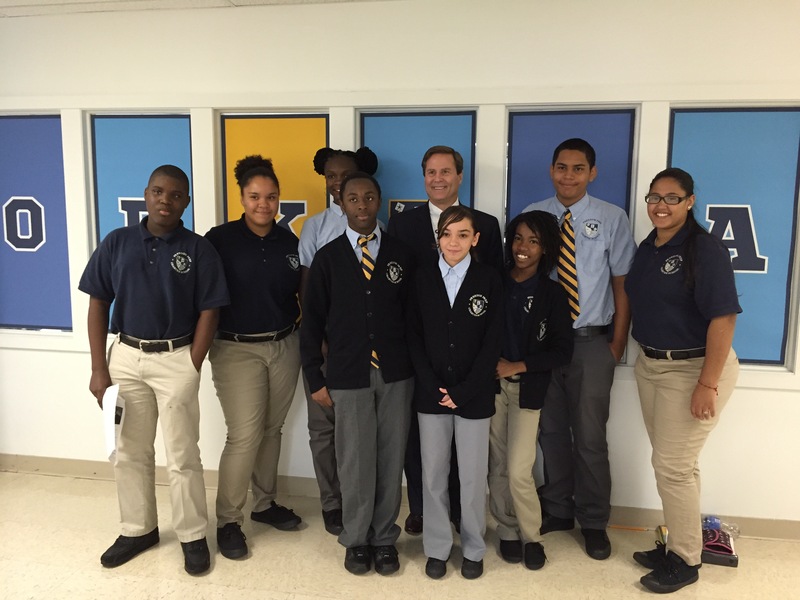 Congressman Donald Norcross, who represents New Jersey’s first district, which includes the city of Camden, visited the school, toured classrooms and sat down with four middle and four high schools scholars. Congressman Norcross told the assembled group about his improbable road to Washington. He said it was never a dream of his to be a congressman, but that he always took advantage of the opportunities life presented. After graduating from high school, he went to a local community college and then became an electrician. Eventually he was given the chance to run for the New Jersey State Senate, which he did, and won. Last year New Jersey’s first congressional district was up for grabs and he grabbed it. He told the scholars about the illustrious history of their city including the birthplace of the first flat record player and the Victor Talking Machine Company, the precursor to RCA, which manufactured records in Camden for more than 60 years. He told the scholars of the history of ship building and the Campbell’s Soup company in Camden when the city employed tens of thousands of works. He told them of the work being done to bring industry back to Camden. He also asked the scholars about themselves, about what they wanted to be; answers included: a plastic surgeon, a chemist and a teacher. One scholar asked what a normal day looked like for a United States congressman. He pulled out his smart phone and pulled up his calendar. Among other things, his day included a briefing on a military bill and an ice cream social. The scholars reluctantly returned to their classes after witnessing a few minutes of living history.